Having an office space at home comes with several benefits – there’s no commute, you achieve better work-life balance, and you can design your area as you please. Whether your home office is an actual room designated for your professional life, or merely a quiet corner for you to pay bills and draw out your schedule for the day, your space deserves more than just a metal table and chair. 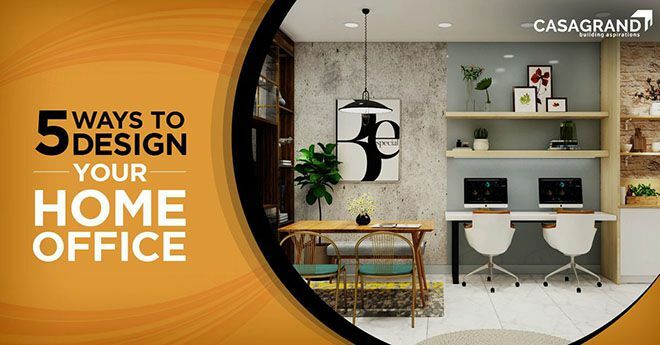 Here are five simple and easy tips to help you create and design a practical, yet charming home office. As is with buying a home, one of the most important aspects is getting the location right. For first-time homebuyers, it is important your new abode is close to your place of work and your child’s school, located in the right neighbourhood, and within proximity to restaurants, cafes, and other entertainment facilities. All this for the sake of convenience. Similarly, your home office will be a space that you will most likely be spending a lot of time in. Everyone has different conditions that maximise concentration and productivity. While some prefer to be in the thick of activity, others prefer to work in peace and quiet. Finding the right location in your home will help you come up with better home office designs. When looking for home office furniture, look for items that are both attractive, but functional. Remember to pick out a chair and desk that are comfortable, especially if you will be spending a lot of time in your home office. Consider your workflow and arrange items accordingly. This will help you with storage, particularly if your home office is in a smaller space. Most importantly, ensure you get plenty of light – either natural sunlight pouring in through a window or sufficient artificial lighting. These home office ideas will not only brighten up the look and feel of your home but will also help with your productivity. One of the biggest advantages of having a home office is being able to design and decorate it to suit your tastes. Start with painting your walls with a striking colour that doesn’t remind you of office grey, beige or white. For some, it could be a vibrant hue of orange or green. Or maybe you prefer something subtle like a pale pink or baby blue. Whatever your choice, make sure your home office design ideas include colours that will stimulate and inspire you. Find out 2018’s top colour trends before doing so. As for accessories and furniture, you can opt to match the décor of the rest of your home or choose something completely different to distinguish your home office from the rest of the rooms. Choose accessories like pen stands, storage shelves, wastepaper baskets, etc. depending on the size of your desk and room. Choose minimalist designs if you have a smaller space, or go for more homey accessories if your home office is in a larger room – use your child’s painting as wall art, hang up inspirational quotes, etc. Here are some home décor trends you can try. When thinking of unique home office ideas, begin with positioning your desk the right way. Place your desk in such a way that you aren’t just staring at a blank wall. If you have a window in the room, place your desk in front of it, so you get as much natural light as possible. If there are no windows, ensure your desk faces the door, so you won’t feel claustrophobic and will have something to look at when you glance up at your computer. Alternatively, you could also place a painting or a family picture on your window-less wall to give you something to look at. The most successful home office design ideas make efficient use of space, particularly when there are no extra square feet to spare. Instead of occupying floor space with cupboards and cabinets, hang floating shelves on your walls to get rid of papers, and office equipment such as WiFi routers, printers, etc. Invest in a desk that comes with drawers so you can use each drawer for your notes, files and folders, cables, etc. This way you will be saving on space as well as ensuring your desk does not become cluttered and messy. We are sure you are inspired to try some of these home office ideas. All that’s left for you to do is buy your dream home to implement them. Head over to Casagrand today to find a superior home for you and your family!